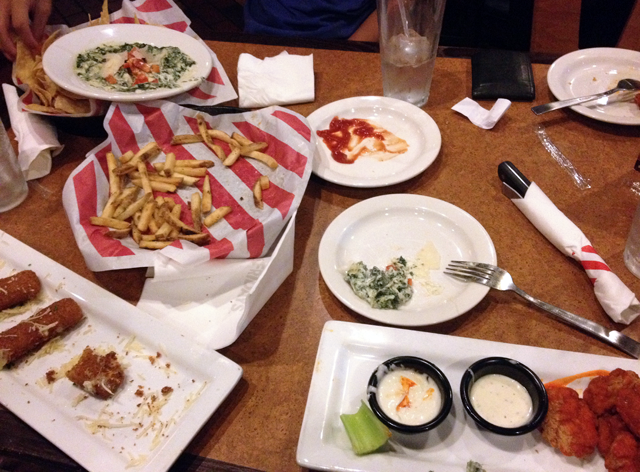 While the rest of Buffalo spent this past weekend devouring the (mostly) local food offered at the Taste of Buffalo, we decided to expand our horizons and try out TGI Fridays new “endless appetizers” promotion: a decision made after the commercial promoting it came on for a third time at Founding Fathers late last week. 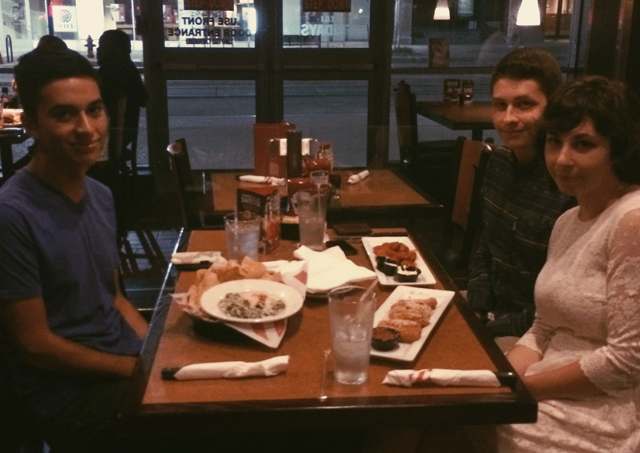 On Saturday night, we trekked down to Fridays’ downtown Buffalo location with our friend Thomas, who soon leaves to spend a half year in Argentina. After all, what better way to spend one of your last nights in Buffalo than a night out at Fridays complete with a midnight stroll along our city’s premier nightlife destination, Chippewa? None of us were really sure what to expect when walking into Fridays, having not set foot in the restaurant chain in the last decade. At about 10:30pm, the restaurant was around one sixth full, surprisingly becoming more popular as the night went on. It seemed like the patrons consisted of either young adults preparing for a night out on the Chip Strip or probable tourist families having a late dinner before retiring to their downtown hotel. We were seated after a minute’s wait and immediately brought menus and ice water by our waitress, Stacey. 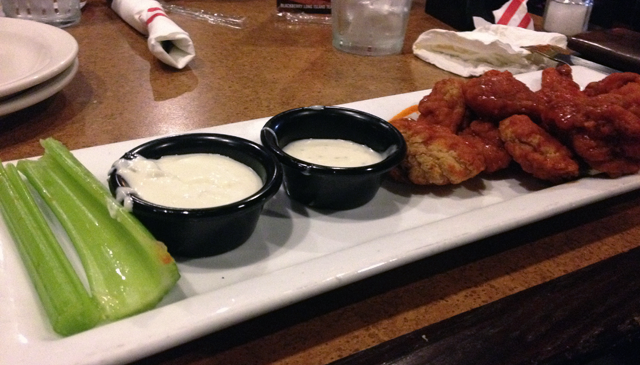 We had come to Fridays for one thing: the endless appetizers for $10. However, the desperate marketing promotion was nowhere to be found on the menu! Luckily, Stacey informed us that she had written down the applicable appetizers in a notebook somewhere, and promptly returned with the list. As decided in a tense conversation earlier that night, Megan ordered the Mozzarella Sticks, Thomas ordered the Tuscan Spinach Dip, and I ordered the Boneless Buffalo Chicken Wings––all, of course, costing a tenner (well, $10.88 after tax). We also made the spur of the moment decision to really splurge and get a basket of fries ($4). Our food arrived within 10 minutes, and it’s safe to say that we were glad to have set our expectations quite low. 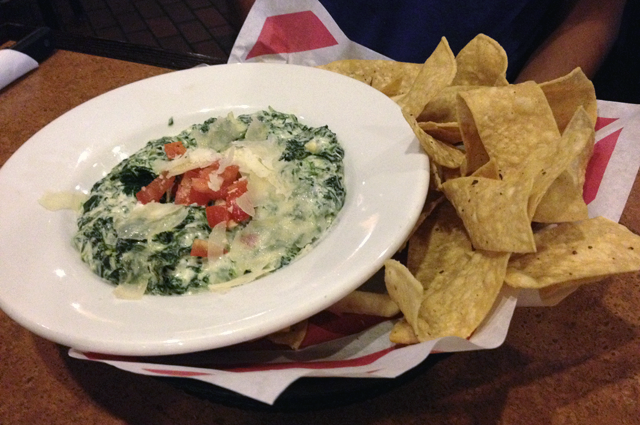 The Tuscan Spinach Dip won the blandest award of the night. It tasted like fat and salt, and if you took a big enough bite, had a modicum of texture from the previously frozen spinach. The “shards” of “parmesan cheese” were a cute touch. Likewise, the Boneless Chicken Wings were perfectly below-average: heavy on the breading, messily tossed in hot sauce, the first order bereft of celery. They were a notch below even Jim’s, which should certainly say something. 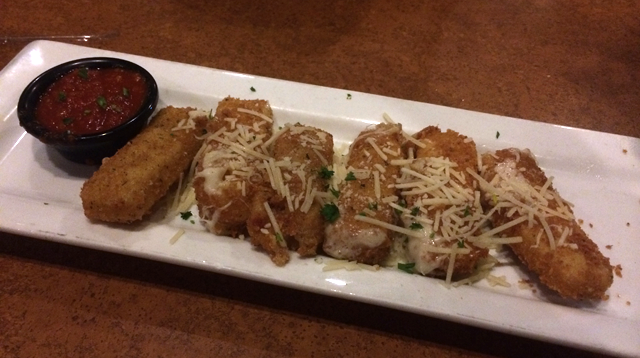 The highest and lowest points of the meal came simultaneously with the Mozzarella Sticks. They were the best part of our meal: tastier than any frozen variety we’ve tried and presented with a touch of care. 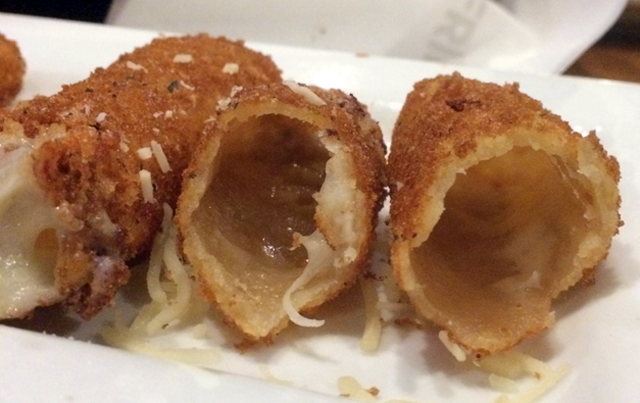 I mean, how bad can the fetishized mozz stix really be? It is worth noting that one thing about our meal exceeded expectations: our server, Stacey. From beginning to end, she was on point. Our service was prompt and friendly, and she made us feel at home even though we were solely there to partake in a corporate ploy. She offered us “round two” on the apps before we were even finished with the first, and even suggested that Megan have a third plate of mozzarella sticks. If nothing else, this part of the meal left us with a smile. That was impressive, too, given that by the end of the meal we were experiencing a severe case of sodium/MSG overdose complete with blurred vision and slurred speech. In other words, we were perfectly ready to take a walk and ogle at what was occurring just down the street. TGI Fridays is located at 601 Main Street in Buffalo, NY.